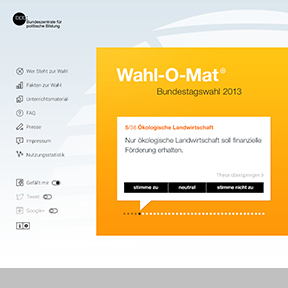 The Wahl-O-Mat is an online tool that aims to assist and mobilize voters in Germany. A questionnaire on key issues is submitted to political parties, who respond stating whether they agree or disagree with various statements or take a neutral position. Voters can then respond to the same statements online. The Wahl-O-Mat shows users the parties they most agree with.